Window Wonderland® | Official Site | Display Dazzling Holiday Movies In Your Window! Window Wonderland® transforms ordinary windows into spectacular displays. Set Up Inside Your Home To Project Magical Movies Outside! Window Wonderland® brings your home to life in just seconds by transforming your windows! Setting up Window Wonderland® is as simple as 1, 2, 3! You'll never have to deal with tangled decorations again! Get your Star Shower® Window Wonderland® today with 6 Halloween movies for just $59.99 and FREE shipping and handling. As our gift to you, we'll include 6 Christmas movies for a total of 12 holiday movies! Double your offer and receive a second Star Shower® Window Wonderland® set PLUS a Star Shower Motion. Just pay a separate fee of $59.99. Hurry and order now! Transform your home in a flash with 1 of 12 built-in movies! Setting up Window Wonderland® is as easy as one, two three! 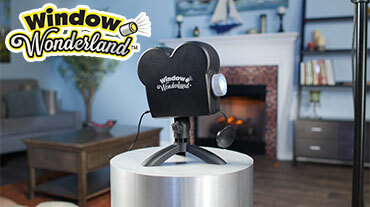 With Window Wonderland®, just pick your movie, choose your orientation and enjoy! Your window displays will be brighter and more colorful, thanks to advanced projection technology. OFFER: Get your Star Shower Window Wonderland today with 6 Halloween movies and audio upgrade for just $59.99 and FREE shipping and handling. As our gift to you,we'll include 6 Christmas movies for a total of 12 holiday movies! Double your offer and receive a second Star Shower Window Wonderland set PLUS a Star Shower Motion. Just pay a separate fee of $59.99. UPGRADE to the DELUXE OFFER to receive the Star Shower Window Wonderland with audio upgrade, 6 Halloween movies, 6 Christmas movies, PLUS 6 MORE MOVIES! Just pay $79.98 and receive FREE shipping and handling. GUARANTEE: Star Shower Window Wonderland has a lifetime warranty that covers the lifetime of the product. Should anything happen to your Star Shower Window Wonderland under normal usage simply return the unit with a handling fee and you will receive your money back, less shipping and handling and/or depreciation. Mistreatment, misuse, and intentional abuse of Star Shower Window Wonderland is not covered under the lifetime warranty. Transform Your Windows Into Dazzling Displays! Order Above! Check out these other great products by Window Wonderland®. TEXT FOR OTHER PRODUCT OFFERS. Hear from other Window Wonderland® customers how much they love it, and why you will too! Check out all the news for Window Wonderland® and its creators at TeleBrands featured all over the world.